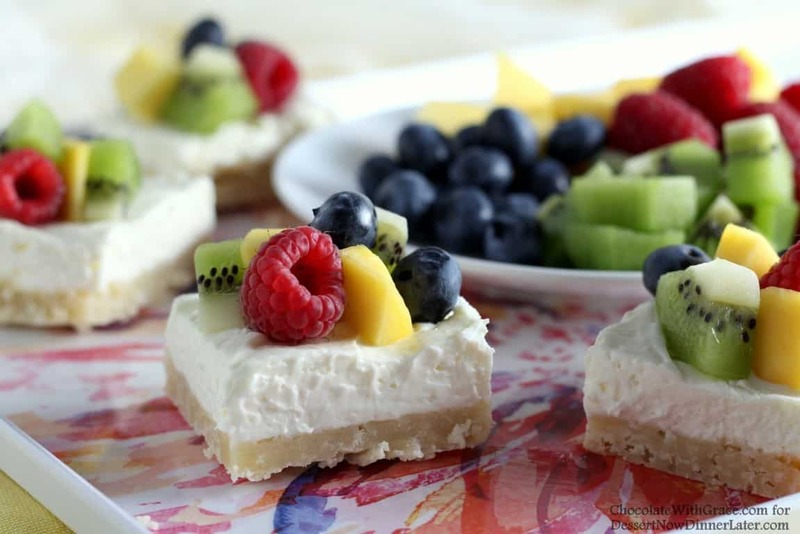 Fruit Cheesecake Bars - Dessert Now, Dinner Later! 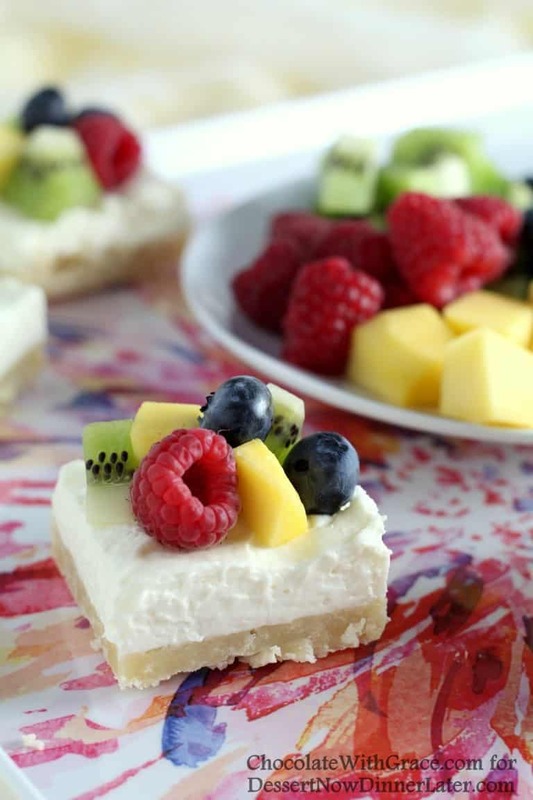 These Fruit Cheesecake Bars have a tender shortbread crust that is topped with a creamy no-bake cheesecake layer that’s piled high with fresh fruit. Hi friends! It’s Mallory from Chocolate With Grace with a recipe for a fun summer dessert to use all of the delicious fruits in season. I know some people have a thing against turning the oven on in the summer, but personally I love baking in the summer! 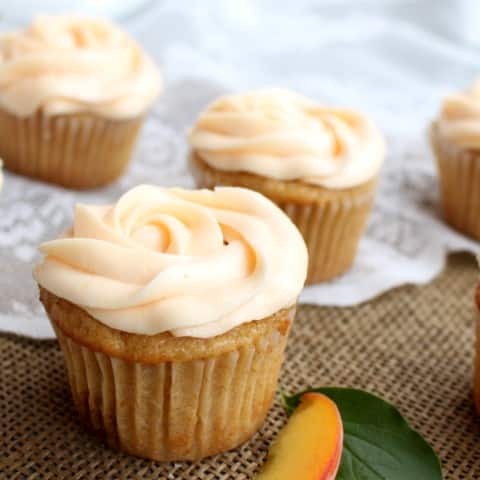 There are so many possibilities with all of the fresh fruits in season. 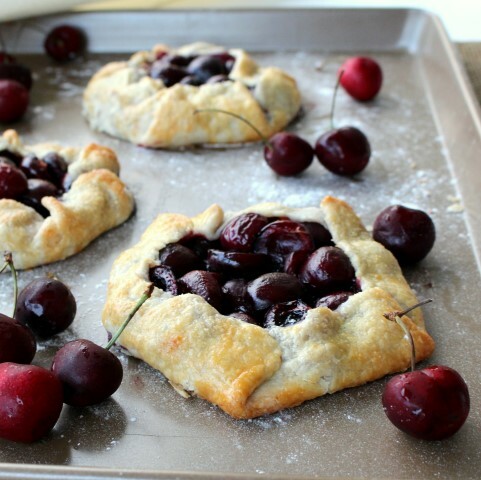 Some of my favorite fruits to use are cherries, raspberries, and peaches. 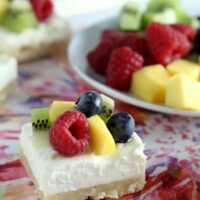 These Fruit Cheesecake Bars are very versatile. You can use whatever fruits are in season or are your favorites. 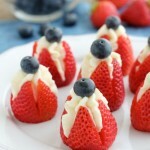 Wouldn’t they be fun with strawberries, raspberries and blueberries around the 4th of July?! I think the red, white, and blue would be so pretty. These bars start with an easy shortbread crust topped with a no-bake cheesecake layer. Then before serving, fresh fruit is piled on top to balance the sweetness of the cheesecake. 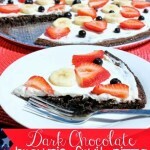 You’re going to love this dessert! 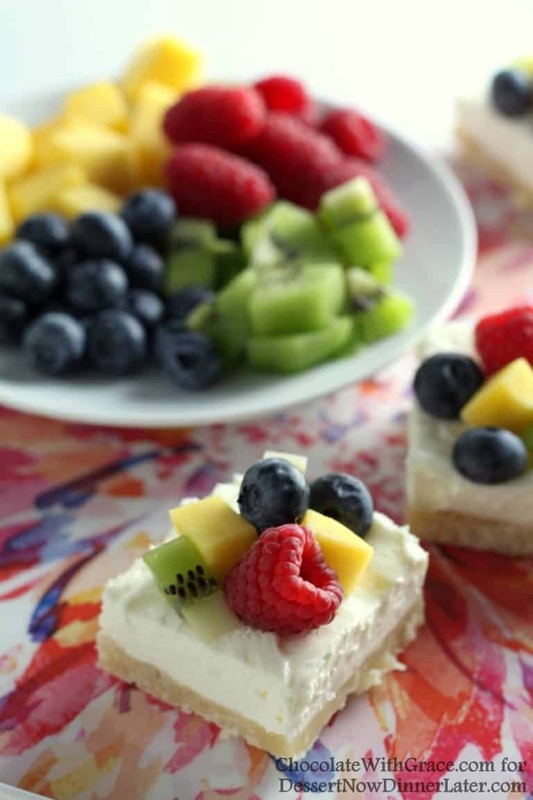 A tender shortbread crust is topped with a creamy no-bake cheesecake layer and piled high with fresh fruit for an easy summer dessert. FOR THE CRUST: Preheat the oven to 350 degrees Fahrenheit. In a medium bowl, mix together the flour and powdered sugar. Cut in the cold butter with a pastry blender until the crumbs are pea-size. Press the mixture into a greased 8x8 inch baking pan. Bake at 350 degrees Fahrenheit for 10 to 15 minutes or until lightly browned. Let cool completely. FOR THE CHEESECAKE LAYER: In a large bowl, beat together the cream cheese and powdered sugar until smooth. Add the heaving whipping cream and vanilla. Beat on high speed for 2 to 3 minutes or until the mixture thickens. Spread on top of the cooled crust and chill for at least 4 hours. Top with fresh fruit immediately before serving. These are so pretty , Mallory! 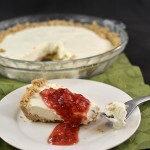 Love that the cheesecake filling is no-bake! These are perfect for spring and summer!